One of the most exciting features of our new Community Memorial Hospital (CMH) in Ventura is our expanded Emergency Department! When you have a medical emergency, your life can depend on getting to the best emergency room as soon as possible and seeing a doctor or nurse quickly. With 37 private treatment rooms – an increase from 17 curtained bays in our current hospital – our new CMH emergency department will allow us to treat the emergency medical needs of our community while maximizing privacy and minimizing wait times. The Emergency Department at our new Community Memorial Hospital features 37 private treatment rooms, an increase from 17 curtained bays in the current hospital. In addition to the significant increase in patient capacity, our new Emergency Department includes a few other key features that will allow us to treat emergent cases in the most efficient way possible. Among these features is a dedicated critical care elevator located adjacent to the ambulance bay entrance. This elevator allows for direct and immediate access from the emergency department to our surgical services, maternal child health, and critical care floors, minimizing transport time when every moment counts. We’ve also added dedicated imaging technology to our Emergency Department! Featuring CT, X-Ray, and UltraSound capabilities, this space gives our physicians the ability to order and obtain diagnostic images quickly. This means that in many cases, patients can be diagnosed, stabilized, treated and admitted or discharged without leaving the emergency department. 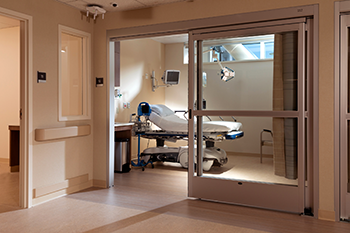 Our Emergency Department physicians and staff also have access to trauma rooms in the new hospital. Although we are not Ventura County’s dedicated trauma center, we are well-prepared to receive, stabilize, and re-route trauma patients to Ventura County Medical Center, and these new rooms give us the space and technology to do so quickly and effectively. 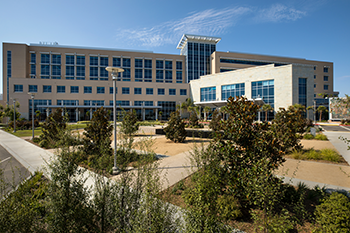 Our new community park is located just steps from the Emergency Department entrance and offers friends and family members an inviting outdoor space to wait for loved ones who are being treated. When our new Community Memorial Hospital opens this winter, patient drop-off and pick-up will be more convenient with our drive-up public entrance and new, conveniently located parking structure on Brent Street. Family members and friends will also be able to wait for their loved ones in an expanded waiting room with plenty of natural light, beautiful artwork created by local and regional artists, and access to our new community park located just steps from the Emergency Department entrance.